Glenna Sue Kidd, 83, of Choctaw, Arkansas was born September 2, 1933 to the late Marvin and Julia (Duncan) Kidd and passed from this life on May 4, 2017. She was a graduate of Clinton High School and received a masters degree at the University of Central Arkansas. Sue taught school for 25 years in Logansport, Indiana, was partner in a dog grooming business and tax preparation business. 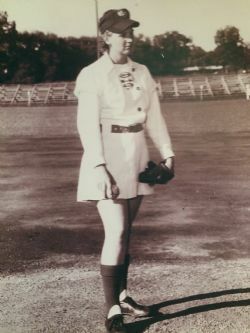 She played six years in the All American Girls Professional Baseball League and is listed in the Baseball Hall of Fame in Cooperstown, New York. Sue played basketball for eight years with the South Bend Rockettes, which was two-time national champions. She was named All American Basketball player twice in the 1950's. Sue was a faithful member of the Church of Christ. Sue is preceded in death by her parents, two sisters; Juanita Butts and Loretta Stephens, and two brothers; Marvin (Buck) Kidd, Jr. And Tommy Kidd. Left to cherish her memory are her brother, Joe Kidd and wife Charlene of Springdale, Arkansas, a very special sister, Sue Jones of Choctaw, two sisters-in-law, Opal Kidd of Choctaw and Amelia Kidd of North Little Rock and a host of nieces, nephews and friends.